Cinderella: Midnight? Oh, thank you. Fairy Godmother: Oh, now, now, now, now, now, just a minute. You must understand, my dear: On the stroke of twelve, the spell will be broken, and everything will be as it was before. Fairy Godmother: [singing] Salaga-doola, menchika-boola, Bibbidi-bobbidi-boo. Put them together, and what have you got? Bibbidi-bobbidi-boo. Salaga-doola, menchika-boola, Bibbidi-bobbidi-boo. It will do magic, believe it or not, Bibbidi-bobbidi-boo. Now, "Salagadoola" means, "A-Menchika-boola-roo," but the the thingamabob, that does the job, is "Bibbidi-bobbidi-boo." Jaq: Cinderelly. Look! Look! Your slipper. Your slipper. Cinderella: Thank you. Thank you so much for everything. The King: My son has been avoiding his responsibilities long enough. It's high time he married and settled down. 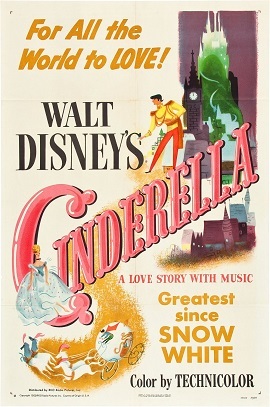 Cinderella: [singing] A dream is a wish your heart makes when you're fast asleep. In dreams you will lose your heartaches. Whatever you wish for, you keep. Have faith in your dreams, and someday, your rainbow will come smiling through. No matter how your heart is grieving, if you keep on believing, the dream that you wish will come true. Cinderella: [to Bruno, the dog] Dreaming again. Chasing Lucifer? Catch him this time? That's bad. Cinderella: Suppose they heard you upstairs. You know the orders. So if you don't want to lose a warm, nice bed, you'd better get rid of those dreams. Know how? Just learn to like cats. Cinderella: No, I mean it. Lucifer has his good points, too. For one thing, he... Well, sometimes he... Hmmm. There must be something good about him. Stepmother: [looking for Cinderella] Cinderella! Cinderella! Cinderella! Oh, where is that... Cinderella: Yes? Here I am. Stepmother: Oh. My daughters- where are they? Cinderella: Uh, I think they're still in bed. Stepmother: Oh. Well, don't just stand there. Bring up the breakfast trays at once, and hurry! [naming the new mouse] Cinderella: Now for a name. I've got one! Octavius. But for short, we'll call you Gus. Stepmother: [to Cinderella when she drops the crockery] You clumsy little fool! Gus: I'll cut it with the scissors! Perla: Leave the sewing to the women. You go get some trimmin'. Mice and Birds: Surprise! Surprise! Surprise! Gus: Duh, duh, duh... Happy Birthday! Jaq: No, no, no, no! Cinderella: Oh, well. What's a royal ball? After all, I suppose it would be frightfully dull, and-and-and boring, and-and completely... Completely wonderful. The King: So he's proposed already! Tell me all about it. The King: Who is she? Where does she live? The King: Oh, no matter, we've more important things to discuss. Arrangements for the wedding, invitations, a national holiday, all that sort of thing. The King: Here, here, have a cigar. Take a few more. The King: Better practice passing these out, eh? The King: A knighthood. I hereby dub you, sir... er, er, by the way, what title would you like? Grand Duke: Sire, she got away. The King: Sir "She Got Away... " A peculiar title, but if that's what you... She WHAT? Why, you, you, you traitor! Grand Duke: Now sire, remember, your blood pressure! Grand Duke: No, sire, no! The King: SABATOGE! You were in league with the prince all along! Grand Duke: I tried to stop her! But she vanished into thin air! The King: A likely story! [as Cinderella prepares to try on the slipper] Grand Duke: Come, my child. Grand Duke: But its true, sire! All we could find was this glass slipper! The King: The whole thing was a plot! Grand Duke: But sire, he loves her. He won't rest till he finds her. He's determined to marry her. The King: What? What did you say? Grand Duke: The prince sire! Swears he'll marry nobody but the girl who fits this slipper. The King: Ha ha. We've got him! The King: That's his problem. He's given his word, we'll hold him to it. The King: Bring her in. Grand Duke: Yes, your majesty. Cinderella: Your Grace. Your Grace. Please, wait. May I try it on? Stepmother: Oh. Pay no attention to HER. Drizella: She's out of her mind. Stepmother: Yes, yes. Just an imaginitive child! Grand Duke: [in an official and impatient tone] Madam, my orders were every maiden! Cinderella: What? In a trap? Then why didn't you say so? Cinderella: Lucifer, let him go! Please let him go. Cinderella: [hums then sings] So this is love. Cinderella, Prince Charming: [both sing] The key to all heaven is mine. Cinderella: [sings] My heart has wings. Cinderella, Prince Charming: [both sing] So this is love. Stepmother: And, by royal command, every eligible maiden is to attend. Stepmother: [interrupting] Hold your tongue! Now, it seems we have time on our hands. Stepmother: [interrupting] Do them again! And don't forget the garden. Then scrub the terrace, sweep the halls and the stairs, clean the chimneys. And of course there's the mending, and the sewing, and the laundry... Oh, yes, and one more thing: see that Lucifer gets his bath. Prince Charming: What's the matter? Prince Charming: The Prince? But didn't you know? Grand Duke: You are the only ladies of the household I hope- [catches himself] I presume. Lady Tremaine: There's no one else, your Grace. Anastasia: Mother, I don't see why everybody else seems to have such nice things to wear, and I always end up in these old rags. This sash! Why, I wouldn't be seen dead in it! Drizella: You should talk. These beads! I'm sick of looking at them! Trash! Anastasia: Oh, I hate this...! Drizella: I don't see why...! Grand Duke: Oh, no! Oh, no, no. Oh, no. Oh, this is terrible. The King! What will he say? Grand Duke: What will he do? Grand Duke: [sobbing] No, no, nothing can help now. Nothing! Cinderella: [bringing out the other glass slipper] But, you see, I have the other slipper. Fairy Godmother: Your Fairy Godmother? Of course. Now, where is that wand? I- Oh! I forgot. I put it away. Anastasia: Oh. Well, it-it may be a trifle snug today. You know how it is, dancing all night. I can't understand why. Stepmother: [indicating the sleeping Grand Duke] Shh. Quiet, my dear. We mustn't disturb his Grace. Stepmother: Young man, are you sure you're trying it on the right foot? Stepmother: Well, I see no reason why you can't go... if you get all your work done. Cinderella: I'm sure I can. Oh, thank you, Stepmother. Stepmother: Of course. I said, "If." Grand Duke: Just a moment! Drizella: [ordering Cinderella in bedroom when being brought breakfast] Take that ironing and have it back in an hour! One hour, you hear? Cinderella: [upon hearing of the royal ball] Why, that means I can go, too. Drizella: [to Anastasia and Stepmother] Hah! Her, dancing with the Prince. Anastasia: [mocking Cinderella] I'd be honored, Your Highness. Would you mind holding my broom. Ha Ha! Drizella: You did it on purpose! Anastasia: It's her fault, Mother. Stepmother: [Angry, slams on piano keys] Yes! Jaq: Lucify. That's him. Meany, sneaky. Jump at you. Bite at you! Stepmother: Get up. Quick, this instant. We haven't a moment to lose. Anastasia? Anastasia. Get up, Anastasia. Anastasia: Huh? What for? Why? Stepmother: Oh, everyone's talking about it. The whole kingdom. Oh, hurry now. He'll be here any minute. Stepmother: The Grand Duke. He's been hunting all night. Stepmother: For that girl. The one who lost her slipper at the ball last night. They say he's madly in love with her. Stepmother: Oh, no, no, no. The Prince. Grand Duke: Your Majesty, I see no point in beating about the bush. I regret to inform you, Sire, that the young lady has disappeared, leaving behind only this glass slipper. Grand Duke: Yes. I'll do it. Grand Duke: No. I... just... can't. Grand Duke: You are the only ladies of the household, I hope, er, I presume? Grand Duke: Well, if I may say so, Your Majesty, I did try to warn you; but you, Sire, are incurably romantic. Grand Duke: No doubt you saw the whole pretty picture in detail. The young prince bowing to the assembly. Suddenly, he stops. He looks up. For lo... there she stands. The girl of his dreams. Who she is or whence she came, he knows not, nor does he care, for his heart tells him that here, here is the maid predestined to be his bride. Grand Duke: [chuckles] A pretty plot for fairy tales, Sire. But in real life, oh, no. No, it was foredoomed to failure. Stepmother: Girls, please. After all, we did make a bargain, didn't we, Cinderella? Stepmother: And I never go back on my word. Hmm. How very clever. These beads. They give it just the right touch. Don't you think so, Drizella? Drizella: Why, you little thief. They're my beads. Give them here. Anastasia: Oh, and look. That's my sash. Wearing my sash, she can't. Stepmother: Girls, girls. That's quite enough. Hurry along, now, both of you. I won't have you upsetting yourselves. Cinderella: Oh, no. No, it isn't true. It's just no use. No use at all. I can't believe. Not anymore. There's nothing left to believe in. Nothing. Fairy Godmother: Nothing, my dear? Oh, now you don't really mean that. Fairy Godmother: Nonsense, child. If you'd lost all your faith, I couldn't be here. And here I am. Drizella, Anastasia: [from downstairs] Cinderella! Jaq: [singing] Cinderelly, Cinderelly / Night and day it's Cinderelly / Make the fire! Fix the breakfast! / Wash the dishes! Do the moppin'! Mice: And the sweepin', and the dustin' / They always keep her hoppin'. Cinderella: [to the clocktower chiming] Oh, that clock! Old killjoy. I hear you. "Come on, get up," you say, "Time to start another day." Even he orders me around. Well, there's one thing. They can't order me to stop dreaming. Cinderella: Oh, I must, please. Please, I must! Cinderella: Well, I-I, oh, the Prince. I haven't met the Prince. The King: Ah! The boy isn't cooperating. Page: Mademoiselle Leonora Mercedes de la Tour. Daughter of Colonel and Madame de la Tour. The King: I can't understand it. There must be at least one who'd make a suitable mother. The King: Er, a suitable wife. Narrator: Once upon a time in a faraway land, there was a tiny kingdom, peaceful, prosperous, and rich in romance and tradition. Here in a stately chateau, there lived a widowed gentleman and his little daughter, Cinderella. Although he was a kind and devoted father, and gave his beloved child every luxury and comfort, still he felt she needed a mother's care. And so he married again, choosing for his second wife a woman of good family with two daughters just Cinderella's age, by name, Anastasia and Drizella. It was upon the untimely death of this good man, however, that the Stepmother's true nature was revealed. Cold, cruel, and bitterly jealous of Cinderella's charm and beauty, she was grimly determined to forward the interests of her own two awkward daughters. Thus, as time went by, the chateau fell into disrepair, for the family fortunes were squandered upon the vain and selfish stepsisters while Cinderella was abused, humiliated, and finally forced to become a servant in her own house. And yet, through it all, Cinderella remained ever gentle and kind, for with each dawn she found new hope that someday her dreams of happiness would come true. Fairy Godmother: Well, hop in my, dear. We can't waste time. Fairy Godmother: Uh, uh, now, now, now, don't-don't try to thank me. Fairy Godmother: Good Heavens, child! You can't go in that.